Tagged #OurFlag, pro-Mugabe adverts are appearing on Zimbabwe state broadcaster and publications in the lead-up to the 25 May Million Man March in support of President Robert Mugabe. Reminiscent of yesteryear’s fast track land reform program when the government flighted jingles to convince the people that controversial farm seizures were part of an unfinished Chimurenga (war), #OurFlag urges the masses to demonstrate in support of President Robert Mugabe. Themed with a song about Jesus – Â â€œUnconquerableâ€ – Â as a suggestive reference to the 92-year old revolutionary, the adverts encourage people to join the Africa Day tribute to the world’s oldest sitting president. However, when more than 4,5 million, roughly a third of the drought-stricken country’s population, could face hunger by 2017, and economic growth predictions foreseeing a recession on Zimbabwe’s horizon, some share a different perspective, sparking controversy among the titans of Zimbabwe’s social media platforms. On 20 April, two days after Zimbabwe’s 36th Independence Day, a frustrated cleric, Pastor Evan Mawarire, 39, started #ThisFlag, a non-political online movement, when he realised he didn’t have enough money to pay his childrenâ€™s second term school fees. Struggling to meet one’s basic expenses is a common lament among cash-stricken Zimbabweans as the liquidity crunch bites and the economy moves dangerously closer towards deflation. Pastor Mawarire’s campaign is simple: wear the flag to show and ask the government why the country is, seemingly, sliding back into crisis.The movement has gained momentum in recent days, however, it’s unclear how much appeal #ThisFlag actually has on the ground. 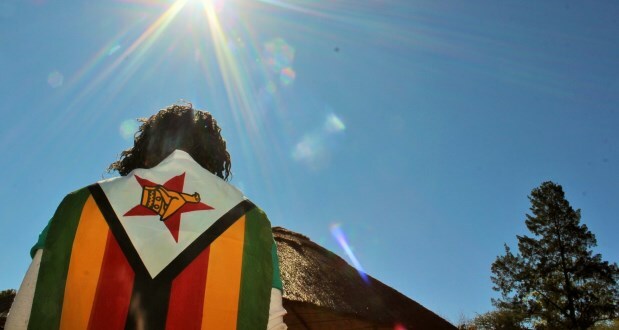 Based on recent observations in the country’s three biggest cities, Harare, Bulawayo and Mutare, there aren’t many people wearing the flag in protest, but there are thousands watching Pastor Evan’s videos online or changing their Facebook profile pictures to have the watermarked Â Zimbabwe flag. That, however, is the easy bit. Change is never instant and online activism has its limits. So #ThisFlag may have to grow beyond the fad to petition for an open and peaceful national conversation to work towards the economic and political transformation many impoverished Zimbabweans hope to see. That’s if #ThisFlag can overcome the blistering critics who aren’t having any of it. Firebrand, Professor Jonathan Moyo, Minister of Higher and Tertiary Education started a counter hashtag, #OurFlag in support of the tribute march for President Mugabe. Organised by the Zanu-PF Youth League, the pro-Mugabe demo intends to â€œcelebrate the peaceful environment that has been brought by the president and the manner in which he [Mugabe] is leading us towards economic solidarity,â€ according to organiser and Zanu PF deputy secretary for Youth Affairs, Kudzai Chipanga. A million man Mao-style march is unlikely to reach the intended numbers, but in preaching to the converted, #OurFlag could achieve its aims; to salute Zimbabwe’s veteran ruler and â€œreclaim the flagâ€ from the #ThisFlag movement and those allegedly advocating for regime change. Recently, Professor Moyo accused the US and Dutch ambassadors of backing a power change, after having expressed their thoughts of #ThisFlag online. Pastor Evan and several other social media personalities have been labelled regime change activists sponsored by the US and European Union, a charge they categorically deny. Undeterred, Pastor Evan is still putting out daily videos promising 25 May will be the day when #ThisFlag ups its voice and demands a response from the government. Just what the “flag pastor” means by this is yet to be seen, but he will not protest. â€œWe are not trying to march, because it’s not a smart idea,â€ he says in day 21’s video. Marching as a freedom of expression is a constitutional right, but even a movement that goes by the maxims HatichadaÂ (We don’t want any more) and HatichatyeÂ (We are no longer afraid) knows the dangers of taking to Zimbabwe’s streets en masse.Thus far, #ThisFlag has taken the subversive route and primarily relied on the power of media to gain visibility. Apart from the viral daily videos, Pastor Evan recently had an interview with a national radio station that ended in a corridor bust-upÂ with ZiFM’s owner, Supa Mandiwanzira, who also happens to be the Minister of Information and Communication Technology. Clearly #ThisFlag has riled up a couple of ministers and the state media, but Mawarire stresses the popular movement is intent on uniting citizens. One month on, the greater potential that #ThisFlag holds remains to be seen, but only if it can leap beyond the digital and into the hearts and minds of the millions suffering through Zimbabwe’s hardships. #ThisFlag started the social media movement, this alone shows tangible results for Zimbabweanâ€™s long-suffering population. #ThisFlag has rallied the whole nation into a conversation involving nation building, democracy and rule of law. #OurFlag is being opportunistic. Thanks for the comment Victor. But I must ask what are the tangible results? Talking about economic and political problems with an online crowd is not enough, there has to be more. If you know of something real and practical that appeals to ordinary Zimbabweans offline & living in Zim then please name it. As for #OurFlag yea they hijacked a name & unfortunately that was bound to happen.